Why did I read this book: I’m on a mission to read all the Nebula nominated (and most of the Hugo nominated) books in the “Best Novel” category – and 2312 has been on my electronic TBR for a very, very long time. Swan is happy, if a bit unstable, and wholeheartedly devoted to pursuing the next great thrill – be that ingesting alien biological specimens from Enceladus, “sunwalking” on Mercury’s surface, or modifying her body (genetically and mechanically). When her close friend Alex dies suddenly and unexpectedly – way before her time at just over a century old – Swan is devastated. She’s not alone in her grief, and finds a number of Alex’s other friends, including a persistent Titan named Wahram, all who contact Swan with the same strange request: is there anything that Alex specifically left behind for me? It turns out that the brilliant, gregarious, and ever-so-paranoid Alex was hiding dangerous knowledge that may have led to her untimely death. Soon, Swan finds herself embroiled in Alex’s secretive project and makes a discovery that could change the balance of power in the solar system – and humanity’s future – forever. Nominated for the Hugo, Nebula, Clarke, and Tiptree awards, 2312 has a considerable amount of buzz (and hype) going for it. I had never read anything by Kim Stanley Robinson prior to picking up this novel, so was especially eager to see just how the book stacks up to the competition. And, ultimately…I’m not sure how to organize and convey my feelings for this book (hence, this obscenely late review). At nearly 600 pages – all pretty dense material – 2312 is an impressive and imaginative exploration of the future of humanity and our solar system. It’s also a lengthy, oddly whimsical book in its structure that trades plotting or character development for a thorough examination of setting, to mixed effect. But more on that in a bit. First, the fantastic. There is a reason that 2312 is up for so many awards – these are all thanks to Robinson’s breathtakingly imaginative scope for the novel. In 2312, Robinson has created a solar system in which humans have managed to spread and ingratiate themselves, even in the most frightfully hostile environments. Facing the dramatic effects of climate change on Earth, leading to millions of deaths worldwide, humanity has looked to the stars for more places to colonize, live and thrive. These humans have built space elevators, developed techniques to terraform the surfaces of Mars, Venus, and suitable moons, just as they’ve found ways to protect themselves from deadly radiation and extreme temperatures. The asteroids are up for grabs in a fascinating type of outer space homesteading, and people create homes on the most unlikely locations. The Mercurians, for example, take great pride in their impossible city, forever gliding along the planet’s surface between day and night. But beyond the (awesome, fascinating, science fiction but certainly grounded in science) space colonization and mechanics aspect of the novel, 2312 also excels in its portrayal of the shifts that come along with exploration and colonization. Humanity itself is changing, in Robinson’s vision of the future. Those on Earth and Mars – the only two planets that are entirely self-sufficient in space, though newly terraformed Venus is quickly growing in power – form their own societies and fracture apart from the hedonistic “spacers,” who have taken to modifying their bodies in new and transformative ways. Swan, like many of her fellow spacers, has installed an Artificial Intelligence unit, called a qube, in her head (her name is Pauline, in case you were wondering). Also like many of her cohorts across the moons, asteroids and planets, Swan is a gynandromorph, a female by birth and identification, but who has modified her body to also have male reproductive organs; as such, Swan has both fathered and mothered children in her life. Wahram, on the other hand, is a self-described androgyn, who identifies as male but has given birth to a child over the course of his long life. These are just two examples of sexuality and fluid gender roles in the universe of 2312 – Robinson has created a future in which orientation, identification, and sexuality are every bit as varied and wonderful as his worldbuilding and setting. Undeniably, 2312 is a fascinating read, as a sincere exploration of what the future of space colonization might look like 300 years in the future. That said, as an actual work of fiction, and as a story? This is not a particularly effective book. 2312 is more of a survey of the future, with a very, very loose mystery plot (the death of Alex and the mystery of who is behind the well-timed “accidents” that have catastrophic results on certain human outposts). 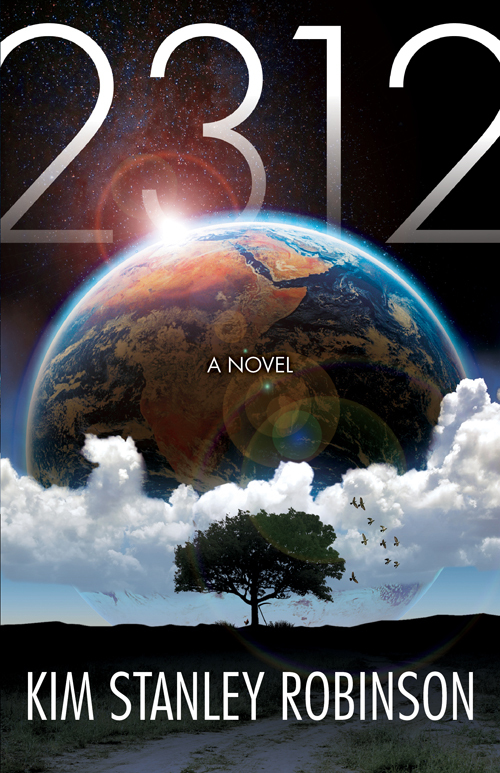 Instead of answering those questions, 2312 takes many detours, explaining and exploring the downfall of Earth or the different outposts humans have created and how they have created them. Really, the plot exists so that our main characters can travel the system and we readers can see just how these different and varied locations have been created and what kinds of people live there. This isn’t necessarily a bad thing (at least, not at first), though it makes for a much longer, slower read. From a character perspective, we get a good understanding of Swan and Wahram – our flawed heroes and eventual lovers (it’s a very strange, slow-moving kind of love story) – but I’m not entirely sure I buy into these characters as defined individuals. That is, for me at least, even though Swan and her cohorts all have personality quirks and we are told their traits and histories, they never felt cohesive, multilayered or fully real. These are characters that say exactly what they are thinking and react in a linear way without introspection or struggle – they are constructs that are there to tell a larger story about the future, rather than living and breathing entities in their own right. 2312 is a fascinating book. It explores humanity and gender and sexuality and evolution in smart, interesting and earnest ways. This is a book that is, in my opinion, worthy of all of the nominations it has received because it is such a huge undertaking of a book, and I appreciate Robinson’s impressive effort to tell the story of a very different kind of future – even though I have conflicted feelings because it doesn’t quite deliver in the plotting or character categories of appeal. Let’s put it this way: deserving of the nominations, but perhaps not of the award. Still, a fascinating, insightful read, and one that I absolutely recommend. Terminator rolls around Mercury just like its sunwalkers, moving at the speed of the planet’s rotation, gliding over twenty gigantic elevated tracks, which together hold aloft and push west a town quite a bit bigger than Venice. The twenty tracks run around Mercury like a narrow wedding band, keeping near the forty-fifth latitude south, but with wide detours to south and north to avoid the worst of the planet’s long escarpments. The city moves at an average of five kilometers an hour. The sleeves on the underside of the city are fitted over the track at a tolerance so fine that the thermal expansion of the tracks’ austenite stainless steel is always pushing the city west, onto the narrower tracks still in the shade. A little bit of resistance to this movement creates a great deal of the city’s electricity. From the top of the Dawn Wall, which is a silvery cliff forming the eastern edge of the city, one can see the whole town stretching out to the west, green under its clear dome. The city illuminates the dark landscape around it like a passing lamp; the illumination is very noticeable except at those times when high cliffs west of the city reflect horizontal sunlight into town. Even these mere pinpricks of the dawn more than equal the artificial lights inside the dome. During these cliffblinks nothing has a shadow; space turns strange. Then the mirrors are passed; that light fades. These shifts in illumination are a significant part of the sensation of movement one has in Terminator, for the glide over the tracks is very smooth. Changes in light, slight tilts in pitch, these make it seem as if the town were a ship, sailing over a black ocean with waves so large that when in their troughs, the ship drops into the night, then on high points crests back into day. The city sliding at its stately pace completes a revolution every 177 days. Round after round, nothing changing but the land itself; and the land only changes because the sunwalkers include landscape artists, who are out there polishing mirror cliffs, carving petroglyphs, erecting cairns and dolmens and inuksuit, and arranging blocks and lines of metal to expose to the melt of day. Thus Terminator’s citizens continuously glide and walk over their world, remaking it day by day into something more expressive of their thoughts. All cities, and all their citizens, move in just such a way. Not really being a science fiction reader, I’ve been getting more and more interested in it – but, even though this one grabbed my attention – I think I’m going to have to pass. Characters are really important to me, and especially in sci-fi. One of the reasons that I don’t read this genre as much is because the technology seems to take over instead of having an actual story and characters in it. I vastly enjoyed his Space (Soap) Opera / Mars trilogy, guess I should give this one a look, too. Don’t think I have this one on my shelves, but after reading your review, I have to say that it sounds like one that ought to be there. I tend to steer clear of science fiction, mostly because I find a lot of sci-fi to be too militaristic for my liking. But by the sounds of it, this one seems to have more of a focus on humanity, which definitely appeals to me. I’ll have to take a look for it! This is a really interesting book. Everybody should read it. I received this book as a gift, and it was always very confusing. But after I read this review I’m beginning to understand it! Thanks!! I remember Kim Stanley Robinson because of the Years of Rice and Salt. It’s an alternate history novel covering a millenium, and countless lives reborn, searching for their place in the universe. I’m fortunate to find this review. For knowing that I enjoyed KSR’s past novel before, I wouldn’t think twice of reading him again. This review sums up my own ambivalence about this book. I’ve never be so frustrated with a book that I couldn’t stop reading. By the way, this is my first visit to your site. I googled reviews of this book. I’ll definitely be coming back. Thanks. Noticed Kim Stanley Robinson’s 2312 is nominated for a Nebula Award and as it looked like the most science-fictional book on the awards list I thought I might like to read it. So I googled a review and found yours! Thanks! I shall put 2312 on my to read list. Unable to find any direct link to Kim Stanley Robinson, so this this forum will have to do as a critique. I found the novel 2312 disappointing, as the author very clearly lifted the name of an asteroid terrarium (‘Yggdrasil’) directly from the Dan Simmons Hyperion and Endymion series used for a interstellar treeship in those books, which in the small world of science fiction is unacceptable. I also found the “lists” merely filler and contributed nothing to the story. Not sure how this can get to KSR, but it somehow should be brought to his attention. Yggdrasil is not a name created by a modern writer. It’s in Norse mythology.